32-Bit ActiveX Control (OCX) for Windows95/98/NT/2000/XP/Vista. Works with VisualStudio.Net, ASP, ASP.NET, VBScript, etc. For the optional text line below the barcodes all windows fonts are usable. Supports DataMatrix, PDF-417, EAN-13, EAN-8, EAN-5, EAN-2, UPC-A, UPC-E, Code39, Code39 Ext., Code 128, EAN-128, ISSN, ISBN, Codebar, Code25, Inteleaved 25, Post 25, Code11, Code93, Plessey, ITF-14, EAN-14, IATA, USPS Intelligent Mail and many more. Check digits are automatically calculated and added. BarcodeX works with all apps and development tools that support ActiveX: Microsoft Office 97 - 2003, Visual Studio, Visual C++, Visual Basic and Visual Basic for Applications (VBA), J++, Visual FoxPro, Access, Word, Excel, Works 4.5, FrontPage, PowerBuilder, Delphi and many more. You only need the OCX - no other DLLs are required to display barcodes. Allows copying of barcodes as meta graphics to the clipboard. 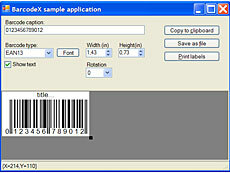 The Picture property allows barcodes to be handled in the same way as picture object in VB. Redistributable - no extra charge for developers.